Go birdwatching with a Birdingpal from Uganda. I live on the outskirts of Kampala, 6miles away from the city center, in a place called Maganjo. The nearest bird (and many other animals) sanctuary is Entebbe Wildlife Center 20miles away. This center has the rare shoebill stork! I am a math teacher in a secondary school. I love photographing birds and providing water and feeds whenever possible. I have very scanty facts about birds and love to know more. I am keen at setting projects that keep the environment i.e planting trees, minimizing the disposal of non-biodegradable items into the soil and using cheap and sources not harm full to the environment such as solar. I am a math teacher in a secondary school. I love photographing birds and providing water and feeds whenever possible. live within the outskirts of Kampala in Uganda 6 miles away from the city center in a place called Maganjo, the nearest bird and many other animals sanctuary is Entebbe wildlife center 20 miles away. This center has the rare shoebill stork. I have very scanty facts about birds and love to know more. I am keen at setting projects that keep the environment i.e planting trees, minimizing the disposal of non-biodegradable items into the soil and using cheap and sources not harm full to the environment such as solar. I am a birdwatcher and nature lover. 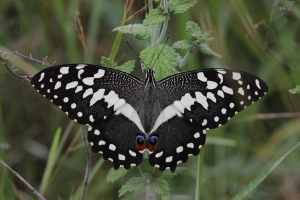 I work with Nature Trails East Africa which I founded to provide nature and birding tours in Uganda and Rwanda and beyond. My country is Uganda, a country endowed with so much in terms of natural beauty and diversity which is well manifested in the huge checklist of diverse bird species. Over 1062 species have been recorded which accounts for 50% of Africa's bird species and about 10% of the world's. Not just birds but also other wildlife including primates such as mountain gorillas, chimps, several monkeys species and baboons, big game such as lions, giraffes, leopards, cheetahs, elephants, lots of antelopes and so much more. I live in Kampala, the capital city of Uganda. Kampala is located on the shores of Lake Victoria, Africa's largest lake and the largest tropical lake in the world. The wetlands along the shores of Lake Victoria are home many birds and provide the best wetland birdwatching opportunities in Uganda. 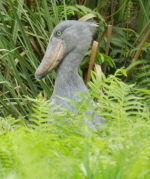 My favorite here is the legendary Shoebill which is spotted at Mabamba Swamp and other wetlands! The wetlands are also a migration route for many Palearctic migrants during the months from September to May. Nature: birdwatching, gorilla trekking, chimpanzee tracking, Nature conservation, traveling to mention but a few. I'm a Ugandan tour guide/bird watcher, mostly taking birding tours to conservation/birding areas in Uganda and Rwanda. I have been a bird watcher/guide since 2006. So with more than 10 year of birding experience, I have been birding with some of the most experienced bird watchers in the World and will be happy to guide bird watchers from all walks of the World. Welcome to Uganda and East Africa. 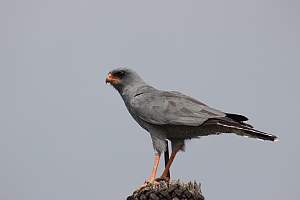 Birding Safari Tours in Uganda, East Africa. There can be a few birding safari destinations on Earth where one can expect to find over 600 bird species in one park alone; Uganda's Queen Elizabeth National Park is one. Uganda is arguably the best birding destination in Africa. With over 1040 bird species recorded in the country, Uganda is the best place to go birding in Africa. Uganda birding safaris lead to notable destinations with a good number of birds and bird watching opportunities. Queen Elizabeth National Park, also a good place for game viewing, with 612 bird species recorded. About 335 species have been recorded in the Bwindi Impenetrable forest, which is also a home to more than half of the World's remaining mountain gorillas. These two parks alone are among the richest protected areas to be found anywhere on Earth. Uganda is not new to birders. Several tourists have visited the country on different birding trips and visited different bird watching destinations that include forests, wetlands, savannah grasslands etc. Accolades for Uganda's birding delights are rarely understated. 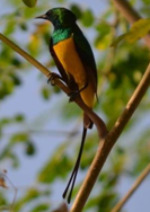 Nigel Wheatley, for instance, in Where to Watch Birds in Africa (1995) said: "In terms of its size, Uganda is the richest country for birds in Africa." And this immense volume and diversity occurs miraculously in a space which keen birders can cover in a relatively short visit. Philip Briggs writes: "Uganda is arguably the best country in Africa for birds, with more than 1000 species recorded in an area the size of Great Britain" . A fact that for Birding safaris, Uganda should be top on the list. Here is a review from one of the Birdingpals (Richard Baxter, from Australia), who has done a 20 day birding safari in Uganda with me. 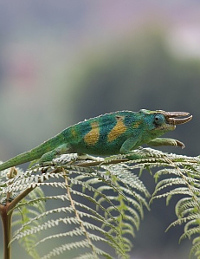 Terrain Safaris, East Africa's wildlife experts. I recently spent three weeks with Paul Kaggwa Kibirango from Terrain Safaris and I would rate him as East Africa's No. 1. Wildlife guide. I've searched for birds and animals in over twenty African countries, as well as hiring guides in many of those countries. Most guides talk themselves up and will tell you they're experts and know it all but when you get out in the field with them and start looking for the rarer species, they have no idea. Paul has memorized the calls over 900 East African bird species and knows where to find them all. He knows his mammals and reptiles and is a genuinely nice guy that has an obvious passion for African wildlife. If you're interested in gaining a more complete picture of Kenyan, Tanzanian, Rwandan and Ugandan wildlife, then I highly recommend Paul Kaggwa from Terrain Safaris, Uganda. (You can see this on review on www.safaribookings/reviews). Starting on Tuesday the 2nd/April/2019. You can book your space today. 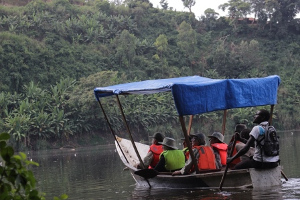 20 Day Itinerary "Best of Uganda, Birding Safari"
Deo is one of the best birding guides in Uganda with over 10 years leading birding trips in Uganda and Rwanda. He is renowned as a great organizer and spotter! His dedication to the profession has taken him to spearhead a community project in his home district to save a degraded community wetland by introducing ecotourism activities. The Nzuguto Community wetland and the nearby Kamweru crater are now very popular spots for birding. Contact Deo today and he will help you plan an affordable birding trip to Uganda and Rwanda. Day 1 Arrival in Uganda at Entebbe International Airport. Early arrivals may give a chance to have leisurely birding at Entebbe Botanical Gardens for a couple of hours in the afternoon/evening. Day 3 Birding to Murchison Falls National Park. This is a travel day, with a few stops on the way to stretch legs and look for birds. We stay in Pakwach in the northern sector of the park. Day 7 Birding to Masindi via the honeymoon track. The southern sector of the park has different habitat- composed of woodland and partly forest especially at the edge towards Masindi, hence different species of birds. Day 8 Birding to Lugogo swamp in the morning for the shoebill and many more. Birding is on a canoe. In the afternoon, we spend some time in the Zziwa Ranch woods â€“ famous for Bruceâ€™s green pigeon. Lugogo swamp is connects with marsh at the Zziwa Rhino ranch. Costs: 2348usd per person. It includes accommodations and meals only as listed, car hire (4x4 toyota land cruiser) and fuel, birding guide charge, park entrance fees, boat fees, ferry fees. Excluded are flight and visa fees, optional activities, all kinds of drinks, tips, laundry, any other item of a personal nature. Uganda as a country is known world over as one of the best birding destinations. The county's multitude of habitats, geographical location, and good weather and climate, make it Africa's best nature paradise. Though not holding many country endemics, the unusually high number of bird species per square kilometer, and the ease to the variably lush vegetation, puts Uganda amongst the top birding destinations. Our 6-person group of birdwatchers from Poland (among us there were 3 professional ornithologists) have taken the trip to Uganda, proposed on www.birdingpal.org site by Deo Muhumuza. We arrived in Entebbe 2nd July 2013 in the afternoon and departed 16th July in the noon. Due to the zeal and efforts of our guides, Deo and Emmy Gongo, also these first and last days, of arrival and departure, were very fruitful and abundant with new species. The itinerary prepared by Deo – from Entebbe’s Botanical Gardens and Alexander Park, via Mabamba Swamp, Lake Mburo National Park, Bwindi Impenetrable Forest (Ruhija – Neck – Buhoma), Queen Elizabeth National Park, Kazinga Channel, Semliki Forest, Kibale Forest National Park to the Royal Mile in Budongo Forest – was excellent, giving possibility to get acquainted with many Ugandian bird habitats: first of all, tropical forests, but to some extent also to water habitats (swamps, lakes, channels), savanna and agricultural fields. However, different types of forest in Western Uganda were definitely clou of the itinerary. Such forests habitats are extremely difficult for birdwatchers; however, with the priceless help of our guides, due to their incredible perceptivity and amazing knowledge of the forest species, we manage to find, see, recognize and shot (by cameras) many very difficult and desirable species – among them such rarities as 13 of 24 endemits of Albert Rift, Crowned Eagle, Green-breasted Pitta, African and African Green Broadbills, White-starred Robin, Shining-blue, Dwarf, African Pygmy and Chocolate-backed Kingfishers, Red-faced, White-headed, Yellow-billed, Double-toothed, Grey-throated, Spot-flanked, Yellow-spotted and Hairy-breasted Barbets, Red-rumped, Yellow-rumped, Yellow-throated, Yellow-fronted and Speckled Tinkerbirds, African, Western and Montane Orioles, African, Red-chested, Levaillant’s, African Emerald, Diederik and Klaas’s Cuckoos, Narina and Bar-tailed Trogons, majority of Greenbuls, Apalises, Crombecs, Sunbirds, Weavers, Widowbirds and many, many others (total amount of species is a bit above 420 species in 15 days). Itinerary proposed by Deo is excellent, seeming optimally to give opportunity to have „best birds of Uganda” in two weeks. He himself is not only excellent guide and organizer but also wonderful man, joyful and very helpful. Our second guide, Emmy, also joyful, helpful, wonderful man, is certainly one of the best guides we have ever met in our birding trips around the world: amazingly perceptive, quick-reflexive, with imposing knowledge of the birds and forest. Both Emmy and Deo as guides, and the Uganda itinerary proposed by Deo, should be strongly recommended for all birders around the world. T. Klys, T. Stawarczyk, A. Wuczynski, J. Lontkowski, M. Sidelnik, M. Solowiej – Poland. Here is what Ulla and I want to express: Deo Muhumuza and Saul Ampeire were our two guides. Deo organized the trip for us and Saul was the driver. Both are Uganda Safari Guides and birding specialists. These two exhibited amazing bird-spotting skills but were also spirited dynamic leaders. Travelling with them was an unparalleled learning experience, not only about Uganda's amazing birds including the Shoebill, the apparition of the papyrus swamps, the Martial Eagle in its military garb, the forest dominion of the Great Blue Turaco with its raucous calls and behavior, the legendary Green-breasted Pitta, the Semiliki Hornbills found nowhere else in Uganda such as the Black-Casqued Wattled and the White-Crested, Twinspots and Flufftails (called in with Saul's whistle), but one day devoted to Mountain Gorilla trekking which was an amazing counterpoint to 14 days of dedicated birding. Deo is an amazing organizer. The accomodations he lined up were affordable and excellent. He is 31 years old and speaks 9 languages. Since English is the official language of Uganda, virtually all of the signage is in this language. These two have bounding enthusiasm, the country can be grateful for Deo and Saul. Try to line up both of them, they compliment each other beautifully. B. Greenfield, MD and U. Allyn Santa Fe, NM, USA. I had a wonderful trip to Uganda with Deo and Robert Jan 23 to Feb7 2014. Deo organized the trip and was the driver (also guide) and Robert the guide. Robert is an amazing spotter and his knowledge of the birds is astounding. No sound or movement escapes him. If there is a bird somewhere Robert will find it. Both Deo and Robert made sure that we saw as many birds as possible and that we all saw them. We were a group of 6 and came from 3 different continents. Deo is not only a good organizer but has a wonderfully friendly and cheerful personality. We truly enjoyed chatting with him. He always made sure that everyone was comfortable and spared no effort to keep us all happy. We all enjoyed spending time with him. I wish him great success in his business , he certainly deserves it . He possesses all the qualities and skills required to deal with many divergent personalities and situations. I just want to add that I found the Ugandans welcoming, friendly and so very kind. Shoebill it's found mabamba swamp. Africa paradise flycatcher it's found around Bwindi forest N.park. Doherty's Bush-shrike it's found around Bwindi N.Park. Rwenzori Turaco it's found Mgahinga forest N.park. White-starred Robin it's found Mgahinga forest N.park. Blac-headed Gonolek it's found Queen Elizabeth Npark. Mgahinga Forest N.Park, Mgahinga Forest N.Park, Bwindi Forest N.Park, Queen Elizabeth N.Park, Mabamba swamp Entebbe, Semuliki N.Park, Bigodi wetland.